A second Domino Mask and Face Framed in Shadow? 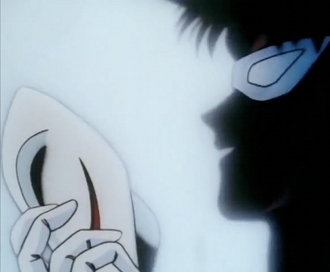 Well played, Tuxedo Mask. "Never show anyone. They'll beg you, and they'll flatter you for the secret, but soon as you give it up... you'll be nothing to 'em." If The Reveal is canceled because the revealer suddenly dies, it's His Name Is.... If the character about to make the reveal is interrupted by some external incident before he could talk, it's a Moment Killer. A Sound-Effect Bleep can be used to create an Unreveal. Another weapon in the Unreveal arsenal is the end-of-episode cutoff. A special case of Unreveal is when we think that the info withheld in an Unreveal earlier in the episode is finally going to be revealed now... only we're frustrated again. A last type of Unreveal is the "you know the rest" gag: A character is giving historical information to another character, and ends by saying "you know the rest," even though the viewer does not. Usually done for comedic effect, since it's a good way to create outrageous backstory without having to make it fit continuity. If this becomes a Running Gag, it's the Noodle Incident. May come in a combo with a Cliffhanger, for greater effect. The reveal is set up to finally take place, and the episode ends: come back tomorrow to see what happens now! And, when the episode starts the next day, there is no reveal after all. See also Unreveal Angle, Missing the Good Stuff and Riddle for the Ages. Regularly used to add fuel to a Driving Question. Contrast Emerging from the Shadows. Not to Be Confused with Everybody Knew Already, which is when a character thinks they're making a reveal, but the other characters already knew. Also dont confuse with The Un-Twist, unless you expected The Unreveal to be subverted. Because of the nature of this trope, spoilers ahoy, both marked and unmarked. Used in this ◊ comic strip of Calvin and Hobbes. Calvin's show-and-tell, in which he neither showed nor told. Given that it's Calvin, he probably did not in fact have anything, and this was his way of getting out of it. A gag on how The Sopranos ended. Another strip has a very similar joke. A Croc: Hullo, zeeba neighba... How is you? The wise man from Hägar the Horrible is seen sitting on his mountaintop meditating when he suddenly has a revelation. He announces "I've got it! The meaning of life is.." He's interrupted by a buzzer from the sky and a voice that says "I'm sorry, your answer must be phrased in the form of a question." It hasn't been revealed (yet) how Verity Carter from The Conversion Bureau: The Other Side of the Spectrum was ponified without becoming a Technically Living Zombie and Extreme Doormat. Other stories have been incredibly tight-lipped about whatever it was that ponified her, to the point of it almost becoming a Running Gag. In Children of Time, Dr. Kit Bennett appears to know the Tenth Doctor, Sherlock Holmes, and Dr. John Watson in their futures. At the end of her introductory episode, she shows the Doctor a locket that seems to tell him exactly who she is... But Holmes and Watson are left in the dark and so are the readers. In Pink Personal Hell And Altering Fate, there is so much foreshadowing that the revelation that Dominic is really Nickel Steel isn't exactly much of a shock. If anything, the "twist" isn't so much who Nickel Steel really was, but how Dominic became Nickel Steel. "Who We Are" is centered around Twilight and the other Mane Six learning that one of them (besides Twilight) has been a changeling the whole time. Halfway through, it becomes apparent that the real point is that, after everything they have gone through together, their personalities and friendships are completely genuine, and when Twilight is finally able to unmask the changeling, she refuses to look and so does everypony else. The changeling reveals herself to the others of her own volition later, and the others reaffirm their love and acceptance, but the narration does not display who she is. In The Captain of the Virtual Console, despite catching a Dugtrio, Red and Gancena never find out what its body looks like. The Hate Game never reveals why America is mad at England, and everyone England asks has no idea why either. Though America does explain why at the end, he does so while eating, causing England (and the audience) to be unable to understand what he's saying. We have this with a Kill la Kill fic, titled Asuka , in which it was never made clear if its either Ryuuko or Satsuki who's terminally ill and nicknamed "Asuka" or which of the sisters was narrating and, after "Asuka" dies of her illness, we still never find out who's who, let alone how old she was. The fact 'Asuka" is never called her real name, if she's referred to by such, in the narration doesn't help this. Similarly to the Disgaea example below, we never find out just what were in the photos Rainbow Dash was being blackmailed with in Turnabout Storm. Profesor Layton Vs Jack The Raper does this with Jack The Raper at one point, where his Face Framed in Shadow is revealed, except the characters don't recognize it. Dipper Pines' given name has been revealed internally several times in Universe Falls, but only in circumstances where the reader doesn't get to learn it (such as in "Forever Alone", when Steven and Dipper learn they can read each other's minds while fused into "Stepper"). Word of God is that a future chapter will feature a scene based on the section in Gravity Falls: Journal 3 where Dipper says his name aloud to Stanford Pines/The Author. The Great Starship Battle ends abruptly without revealing who the "mysterious benefactor" is. Yzma: ...how did we, Kronk? Kronk: Well, ya got me. By all accounts, it doesn't make sense. In a hilarious moment, just before the final fight with Tai Lung, Po is given a pep talk from his adoptive father — and just when it seems Mr. Ping is about to admit that the panda is not his biological son (presumably to suggest he doesn't have to limit himself to a future in noodle-making), he instead reveals the secret ingredient of his special recipe. To clarify: the panda's adoptive father is a goose. However, in the sequel, Po trying to figure out how and why his birth parents abandoned him becomes one of the twin engines driving the story. From the same movie we have the Wu-Shi finger hold. When it's first demonstrated, we don't find out what happens when the user flexes their pinkie; all we know is that Po is terrified of the move. In the movie's climax Po uses the move on Tai-Lung (who, despite being a formerly unstoppable badass, is similarly frightened of the move and claims it is impossible for Po to pull off), and it looks like we're going to be getting answers...then the camera cuts away into the distance and all we see is a massive pulse of golden...something. When next we cut back, Tai Lung is nowhere to be seen. In the third movie, it turns out that it sends someone to the spirit realm. In Lady and the Tramp, there's a running gag in which Trusty the Bloodhound is about to mention some sage-like advice his grandfather Old Reliable used to give him, only to be told that he's already told it to the main characters some time before. At the very end when he's about to tell it to Lady and the Tramp's puppies, he realizes that he's completely forgotten what Old Reliable said to him now, so we the audience never learn what the advice was. In Monsters vs. Aliens, evil alien Gallaxhar begins his backstory while being cloned, but the copy-machine cloning process frequently interrupts him during all the meaningful parts. He ends with, "But I've told you too much already! ", drawing a confused look from Susan. One of The Twelve Tasks of Asterix from the movie of the same name is to venture in the Cave of the Beast, supposedly some horrific creature. We never get to see or hear it at any time, and it's implied that Obelix ate it. In his 1956 novelty hit, Jim Lowe never does find out what's going on behind "The Green Door" . Neither do we. Similarly, in Tom Waits's "What's He Building In There?" from Mule Variations we never find out what he's, well, building in there. It's sort of the point, because the song is about suburban paranoia. He asserts "we have a right to know", but in fact we don't. What is it? It is it! In "Fillmore Jive" by Pavement, the song cuts off before Stephen Malkmus ever tells us what their throats are filled with. Either that or they're filled with an A bass note. "The Mariner's Revenge Song," by The Decemberists ends with the eponymous Mariner telling the target of his revenge "now lean in close/and I will whisper the last words you'll hear". Although the music goes on for another minute, there are no more lyrics to the song, leading the Mariner's final words to his victim unknown. Another Muppet Show episode featured Fozzie performing the world-famous "Banana Sketch" by legendary writer Gags Beasley. Kermit's never heard of it (to the amusement of his co-stars), and when he prompts Fozzie and guest star Sandy Duncan to perform it, they start laughing and can't collect themselves to tell the joke, leaving the audience just as much in the dark. On I'm Sorry I Haven't a Clue, there's a round called Closed Quotes. The chairman says the beginning of a quote, the panellists finish it in a humorous way, and the chairman reveals the real answer. At least once, Chairman Humph has neglected to give the answers because they're too boring, at one point just saying "Sod the answer, buy the book". On another occasion, after not bothering with the real answers for several questions, he said "The producer's just told me I should read out the real answers if they're funny. That's what I've been doing!" And of course there are the rules to Mornington Crescent. Though they can be found in these days of the internet, it is considered bad form just to let anybody know. Opie & Anthony sometimes have a tendency to discuss various top-10 or top-20 lists... but decline to state what number 1 on that list is (either tossing it to the side and going on to something else or cutting to commercial). Jon Dore has an Overly Long Gag where he starts telling a joke, but forgets the punchline. After trying to remember it for several minutes with no luck, he tells the audience that he likes to record his sets on tape to listen to later, and he just so happens to have one with him, so he'll just play that into the microphone for everyone. He skips through the tape until he reaches the joke... and then Recording!Jon also forgets the punchline... and pulls out his own tape recorder. The Jon on this recording actually starts into the punchline... and then Live!Jon's tape craps out and becomes unintelligible static, much to his frustration. In The Stranger's Dream in Bastion, all you learn is that Rucks once wrote an alphabet book. There are a few hints that suggest it was to win time - the First Incarnation's crimes were so great, he wouldn't possibly have been able to atone in just one lifetime, and would have gotten stuck in the Blood War forever but it's still never revealed what they were. Of course, it's also pointed out that even if it hadn't backfired, it wouldn't have worked. Also, the repeated question, "What can change the nature of a man?" You get to answer it yourself, but whether it's the right answer is anyone's guess. Possibly the best and most thematic answer is that anything can change the nature of a man, as long as you believe in it. Several times throughout Half-Life 2, various characters seem to fully assume that Gordon is clued up on everything that is going on in the world, and make constant references to wars, characters and events that you have no explanation of. You can eventually piece together some of the info from newspaper clippings on various notice boards or listening to Dr. Breen's interminable speeches, but the game is pretty obtuse. It's not until Episode One that you lean the fairly basic fact that twenty years have passed since the events of the original Half-Life, for example. The build-up to what happened to Revan, or for that matter what exactly he saw that was such a threat he had to abandon everything and everyone he loved, ends on a less-than-satisfying note either resulting from or aided by a rushed release and an unfinished end game. The fate of Revan (and the Exile) are finally revealed in the backstory to Star Wars: The Old Republic. They died fighting the Sith Empire in the Unknown Regions. The game utilized this trope in the final confrontation with Kreia / Darth Traya. The notes for their voice actor in the script even explicitly spelled out the lack of a Luke, I Am Your Father moment. In Yoshi's Island, the end credits sequence shows the stork returning baby Mario and Luigi to their parents, but all that's shown is their feet. However, in Yoshi's New Island, this is the plot point that starts the events of the game. It turns out the stork had delivered Baby Mario & Luigi to the wrong parents, who are Toads, of all things. This trope is used AGAIN at the end of the game. Shy Guys, recurring enemies in the Super Mario Bros. series, wear masks, and many games at one point mention what their identity would be. In Mario Power Tennis, if Shy Guy wins a match, he will step up to get the trophy, but trips and falls down, his mask falling off. He is facing the other way, but Luigi, being able to see his face perfectly, looks astonished. This again happens in Mario Strikers Charged, except no one appears to have seen it. In Luigi's Mansion, Shy Guy-like ghosts appear as enemies. Their masks can be removed, and seen perfectly, although it is merely black space with two glowing yellow eyes visible. Master Chief takes off his helmet at the end of Halo: Combat Evolved just in time for the cockpit of his ship to obscure his face as the camera pans upwards. However, in the PC version it's possible to take control of the camera. Leaving it in the ship results in MC revealing his head to be graphically represented with another helmet, like this . The opening cutscene of Halo 2 plays this a similar way — Master Chief, who has just finished suiting up, picks up his helmet and puts it on as the camera pans upwards from his chest — just not fast enough to catch a glimpse of his face. At the end of Halo 4, the Chief gets his armor removed, and just as his helmet is taken off, as per tradition, the scene goes black. Halfway averted in the Legendary ending, where the area around his eyes is shown (though the eyes themselves are mostly shadowed out). During the Last Stand in the epilogue of Halo: Reach, Noble Six discards his/her damaged helmet, but his/her head remains out of view. The same thing as in the Halo ending happens in Mass Effect 2, when Tali takes off her helmet. People have made so many speculations about what Quarians look without their suits, that the designers decided that nothing they could come up with would really do it justice. Which, considering the reaction to the reveal in Mass Effect 3, was correct. Nintendo Power's Howard and Nester comic series usually gives you straight hints and tips on one of the latest games that month. For the Startropics comic, they spent the comic building up to how to submerge Sub-C. While Nester is screwing around trying to get the submarine to go underwater, Howard Phillips explores a cave and finds a note within a bottle. He comes back out saying he found the code to submerge Sub-C, only to find that Nester used a six-inch drill with a carbide tip to sink the ship. Note that the code itself was not actually revealed through all of this. The answer is 747, if you were wondering. There's actually a behind the scenes reason for that. One of Disney's rules they set for Square was that Mickey Mouse could not be featured prominantly in the game, as they didn't want the game to piggyback off his popularity. They could show him, at most as a quick cameo for a few seconds. Square got around that by making him the "King" who Donald and Goofy are searching for, but never manage to catch up to until the very end of the game, where he is still in shadow except for one brief (ie: the cameo) moment where he turns and you can see his face. It works too, because even though the "King" is obviously Mickey (personal seal is the Mouse symbol, Minnie is his queen and Donald, Goofy and Daisy are his court) his name is never mentioned and he never shows up until that one scene. If Disney was mad about Square playing around with their rule they never said as much, because KH was such a massive success they gave Square unrestricted access to Mickey from that point onwards, hence Mickey becoming a major player in later games. This is ultimately subverted in Kingdom Hearts 0.2: Birth by Sleep - A Fragmentary Passage, which shows what Mickey was doing in the Realm of Darkness, and how he got behind that door. In the final scenes of Kingdom Hearts χ Back Cover, the Master of Masters entrusts Luxu with a mysterious black box engraved with the words "X Super", warning him that he must carry it with him and never open it. To assuage Luxu's curiosity, the Master of Masters reluctantly agrees to tell him what's in the box, but naturally the audience doesn't get to hear it; all we get is Luxu's shocked reaction and the Master of Masters mischievously responding to Luxu's confused questions with "You'll see." When King Trode finally gets turned from a troll back to a human at the end of Dragon Quest VIII. he looks pretty much exactly the same. Naturally Yangus finds this hilarious. A discouragingly large amount of the plot of Vagrant Story goes unexplained, despite constantly dropped hints that the next bit of dialogue or the next cutscene will explain something important, and the game being made by Squaresoft, a company that loves its exposition so much its works will usually go into detail about anything and everything they can. The biggest unreveal, and the only one the game goes out of its way to point out to the player, is the significance of Ashley's dead family; maybe he genuinely had a wife and son who were killed by thugs during a family picnic... or maybe he murdered an innocent family in the course of his duties as a soldier, and through a combination of his own grief and advanced brainwashing techniques, managed to convince himself they were his family rather than face up to the truth. In Loom, even the other characters in the game are curious as to what a Weaver's face looks like, despite the rumors that to gaze upon one means death. However, when one character finally looks under Bobbin's hood for himself, the camera cuts away to another location. Screaming is heard in the background, and when the camera returns, Bobbin is re-hooded and the other character is simply gone. The expert mode of the game reveals the character's fate, but hides Bobbin's actual face behind glowing light. Interestingly, Bobbin's dialogue in the original game implies that the answer as to what lies beneath his hood may be "Nothing." The re-released version removed this line. Zeno Clash: Subverted. Ghat refuses to speak of why he broke with Father-Mother, no matter how much he is prodded, with the intention seemingly being to allow the audience to draw their own conclusions, much as with the rest of the story. With a minute left of the game Golem decides to tell everyone against Ghat's wishes: that Father-Mother is neither their father nor their mother. Several Artix Entertainment games have an NPC named Galanoth, an Author Avatar for a member of the dev. team. Galanoth almost constantly wears a helmet that obscures much of his face, and the players never get to see just what he looks like without his helmet on. A running gag seen frequently throughout each of the games is to have his face obscured by something else, like a temporary replacement mask or something in the foreground, or for Gal to be offscreen entirely when his helmet is off, but at least one event in DragonFable had a more traditional Unreveal, with a setup. In Hector: Badge of Carnage's first episode the main character poses as the middleman in a shady deal, where something called the "Thing" is exchanged for a suitcase of money. Hector doesn't know what the "Thing" is, and as he has to keep up his cover he can't ask the gang members he is conducting the deal with about the details, forcing him to improvise his way through the deal, eventually convincing the crooks that they can pick up the "Thing" at an appointed location later. In the second episode Hector's partner, Lambert, meets the actual middleman from the deal, but he is just as ambiguous about what the "Thing" is, so Lambert quickly gives up asking. Diglett and Dugtrio are specifically programmed within the Pokémon games to have animations that avoid or get around situations where they would have to appear fully above ground, thus revealing what they look like underneath the ground. Things like going either underground instead of jumping or simply refusing to jump within the Pokéathlon, running between bushes within the Poké Transfer capture minigame instead of jumping between them like the other Pokémon, be the only Pokémon to fade into the battlefield instead of dropping onto the ground within the Generation V games, etc. Even within the 3D games (including the sixth generation), this trope applies — if they somehow managed to either perform moves that involves them souring into the air or get hit by moves that lift them up into the air, only the visible part of their body goes into the air. That, and also the rubble by their neck (or whatever part of their body that's supposed to be), as if said rubble's part of their body. They can learn several claw based moves, hinting that they at least have front limbs, but these are never shown, even when they use the moves. The fans has made numerous depictions of what they might possibly look like, including a infamous drawing of Dugtrio being three muscular men hugging underground. Every time the Pyro's gender is teased in Team Fortress 2. Apparently, not even Valve themselves know. In Undertale, after you fall down a waterfall, a mysterious voice that knows your name calls out to you in the darkness, and in very slow Scrolling Text says "My name is..." just before the screen whites out completely. It is only made clear much later in the True Pacifist route that Frisk is flashing back to Chara/The Fallen Child's, well, fall—since they land in the same bed of golden flowers—and that the speaker is Asriel. The voice shows up again in the mysterious phone call Frisk gets on the elevator, during the True Pacifist ending, but it's not until the very end that Frisk and the player can make the connection. Several plot points of the main quest fall into this. To note, something happened 4000 years ago which caused the Dwemer to disappear, Nerevar to die, and the Tribunal (and Dagoth Ur) to achieve godhood. Speaking with those who know much about the situation, including the last living Dwemer, mortals who've spent their lives researching, and even a few of the deities involved leads to Rashomon style contradictory accounts from all of the parties. While there is enough evidence to form some decent theories, the game ends without revealing the truth. Is the Player Character really the reincarnation of Nerevar and The Chosen One of prophecy? Or is he/she merely a convenient pawn of Azura? Or has the Player Character, by fulfilling the conditions in the prophecy, become the Nerevarine? Again, no definitive answer is ever given. The Mega Man X series is confirmed to take place after the Mega Man (Classic) series, but the moment one starts to transition to the other has never been officially shown. When Dr. Wily "took over" the official Mega Man Twitter to hold a Q&A session, one fan attempted to get an answer to this by asking him what "Zero" is. His response? Dr. Wily: Is this a trick question? It's a number, of course. Next question! In the first case of the second game, you receive the Judge's business card, but examining it reveals that Phoenix can't read the fancy calligraphy it's written in, thus, not revealing the Judge's name. In Dual Destinies, the phantom is shot by a sniper right as he takes off his final mask and collapses into the shadows of the courtroom, leaving his true face obscured. In Katawa Shoujo, Kenji asks protagonist Hisao to pick up a box at the post office for him. It is implied to be something important for Kenji, but at no point in the game its contents are revealed. On the official Katawa Shoujo forum, in response to questions about the box (and fans' repeated desire for/questions about a route for Misha), a member of the dev team (jokingly) responded "The box contains Misha's route." showing us worldless, quickly flashing images that don't reveal anything significant. We just know that the contents of the book are shocking enough to drive Ange to suicide and stubbornly deny everything in it. On Luna's path, the protagonist Sigma finds a key-like object in the GAULEM Bay. Later, when he and Phi find K, whose identity is obscured by a robotic suit and mask, dead in the Rec Room, Phi realizes that this is the key to unlock K's suit and remove his mask. She inserts and turns the key, only to discover that because there is an ax buried in the back, the suit is powered down and will not unlock. Ultimately subverted, because we do get to unmask K in another ending: his. In the Tenmyouji ending, Tenmyouji states that he knows who Zero is, and then he and Quark escape through the number 9 door, leaving everyone else behind forever, before he says who it is. In Sugar's Delight, just when Chocoa is about to reveal her real name, Ichigo falls asleep from exhaustion. And so, neither her nor us ever find out. On Homestar Runner, in the Strong Bad Email the chair , Strong Bad rips off his mask, gurgles in pain, says he'll never do it again, then offhandedly shows a picture of his parents. The catch? A new, high-backed chair means the audience can't see any of it. Even using a flash decompiler on the cartoon is of no help, as the photo is revealed to say "Nice try, dodongo!" . Naturally, the two Unrevealed things are two of the biggest mysteries of Homestar Runner. In another e-mail, the secret to Strong Bad's typing with boxing gloves on is revealed... by The Cheat, who can only use squeakish noises. For all we know, The Cheat could've said "Just fudge it! You know, like you do everything else!" In "Best Caper Ever", Homestar is stranded on an ice floe in the middle of the Atlantic Ocean. The entire cartoon (other than a bunch of Homestar non-sequiturs and a brief run-in with Strong Sad) is Strong Bad and The Cheat hashing over the one thing they remember about this incident and lamenting that they don't know any more. We never find out how Homestar ended up on that ice floe. Or how Strong Bad and The Cheat got satellite footage of Homestar on that ice floe. Or if there ever was any caper, for that matter. Just par for the course. In the video for "Experimental Film" by They Might Be Giants, there's a scene with a picture of a guy captioned "Our Gracious Host". In one of the commentary tracks available on the Homestar Runner DVD, Strong Sad asks The Cheat who he's supposed to be. The only part of The Cheat's response Strong Sad bothers to repeat for the audience reveals that the guy's name is Stephan. Strong Sad's response to The Cheat's explanation for why he's in the video is "Okay, whatever keeps you off the streets." In the French short film Fat a farmer's dog, livestock, tractor, pitchfork and wife all spontaneously inflate for no given reason. In The Order of the Stick, the elven wizard Vaarsuvius's gender is left ambiguous, and multiple attempts by other characters to discern their gender end in Unreveals. For instance, when they're turned into a lizard, Belkar lifts their tail and comments: "You know, if I knew more about reptilian reproductive anatomy, I'm sure this would answer a lot of questions." When V's application to join the adventuring party is shown, there is an ink smudge in the blank for "Gender", which they refuse to correct, citing the possibility of getting ink on their robe, and remarking that the question is irrelevant anyway. When the other characters stop to use the men's and women's bathrooms, V doesn't have to go, and later it's mentioned that, while camping, V always turns invisible before peeing, to annoy Belkar. Later on a dragon attempts to get revenge on them by killing their "mate" who appears to be just as ambiguously gendered. This is made more complicated by their children being adopted (and who refer to V and "mate" as "Parent" and "Other Parent"). Xykon's pet "Monster in Darkness" is being saved up for a reveal when it's "dramatically appropriate". He's been planning this reveal since strip #103, almost ten years ago real time. One story arc has Haley start speaking in a cypher as a result of trauma partly caused by her (at the time) unrequited love for Elan. A cleric tells her that her affliction will clear up when she is ready to reveal the secret, so in this strip , she tries to tell Elan various secrets (but none of them is the secret that will cure her). Decrypted, her secrets are: "Elan, I'm in love with you. Completely in love. ? My dad is being held ransom by an evil dictator. ? I'm not really in the Thieves' Guild anymore. ? I cheat at solitaire. ? I have a tattoo you've never seen. ? I kissed a girl once.  OK, OK, more than once! ? Elan, it turns out I may not be exactly what you would call..."
El Goonish Shive has done this twice: once with the history behind Sarah and Tedd's rivalry, and once with Ellen's odd sleeping habits . Both eventually got resolved. It has been done again, this time with Tedd's magical impairment. The Wotch loves this one. The meaning of the last three letters of D.O.L.L.Y. (the first two are "Daughters of") is Unrevealed three times , as is the explanation of Dee's tail . off-panel again. Eventually Jones explains that she doesn't actually know what she is, but theorizes that she was brought into existence retroactively by human intelligence, or...something. MYSTERY SOLVED! of how a heart monitor works . Tea: This is what we're going with? You're sure? Chapter 42: Catalyst also opens In Medias Res with Annie and Smitty running away from something ("That didn't exactly go to plan! "), meeting up with Mr Eglamore and Parley, and them all running. We then cut to Annie telling the story to Kat. When Kat asks what they were running from, Annie says she'd rather talk about Kat's Secret Admirer. Eventually, we get a flashback to shortly before it happened ... and then we see the scene from pretty much the same perspective, still with no sign of what they're running from. Genuine big reveals, on the other hand—like the cause of Surma's death—usually come out of nowhere. until this strip , where we finally do see what she looks like, now that we're expecting it to be The Un Reveal. This Nedroid fan art ◊. For those interested, Nedroid himself later answered this question on his "about" page. In the second-to-last part of the Gooey Bomb arc, Dedede suggests taking Meta Knight's mask off while he's asleep, to which he wakes up and threatens them. They ignore this, and the camera cuts to the back of Meta Knight, stabbing the Gooey Bomb as Adeleine takes the mask off. Aftermath, for the curious : In the final part itself, Meta Knight's cast essentially covers for his mask, covering all of his body with the exception of an even smaller eye window. In the Turnabout Kirby arc, Meta Knight references the incident and shows the judge the "scars" from it, although again the camera shows the back of him. Subverted (partially) at the end of the Cocoon Academy arc, where Meta Knight's eyes are seen in full, with everything below them obscured by a bedsheet. Finally averted with the Final Destination arc, where he throws his mask at Kirby and King Dedede to get their attention. His maskless appearance is the same as in his official appearances - The same as Kirby, with dark blue skin and yellow eyes. Although... His eyes are colored white here due to said comic's "normal" sections being in the comic-as-a-whole's usual blue-monochrome colors. In the Paper Mario fan comic A Castle Divided , Yoshi Kid (a.k.a. the Great Gonzales Jr.) is about to tell Goombario what his real name is when he gets cut off. This was obviously done because the Yoshi partner is named by the player, thus has no official real name. Misfile fans got a tease of what boy-Ash used to look like. In Bob and George I give you . . . Mega Man X . Slightly later, Vriska's discovery of another juju, which could be used to defeat Lord English is handled with a Call-Back to the above scene. This trope is then defied when Vriska manages to yank the narrative back to her perspective and dumps the thing on the ground so everyone can see what it is. Unfortunately, it remains unclear how it works. In A Girl and Her Fed, we still don't know the identity of the ghost who set the Pocket President program in motion. We've seen him, but the art style made his identity ambiguous . When Ben is told (off-panel) who the ghost was, he expresses dismay that "a nobody... a drone" would move against him and the other more famous ghosts like that. All we really know is that psycho ex-agent Claire (Who's working with the antagonist ghosts) calls "her" ghost (Who looks like the same ghost) "Henry." The Serpent's identity in Zap!. It was so obvious that a guest comic spoiled it months before it was officially revealed. One may argue that this was just a setup, and the real reveal was Zap's identity instead. Commander Kitty himself is only known by his nickname, and at one point tries to reveal his real one on Twitter, only to run out of space before he can say it . White Dark Life: Matt is eventually asked about his parents in a crossover RP. However, he only remembers that they were normal people. Cosmo surprisingly ends up being the most annoyed. In this Darths & Droids strip, Annie is cut off before (presumably) saying the GM's name. We are introduced to a "secret becoming unrevealed" in this Megamanspritecomic strip, but the rest of the comic never reveals what the secret even is. Double-subverted at the very end of The Adventures of Dr. McNinja, when Doc finally removes his mask... offscreen. But then, the last few pages Time Skip to a hospital, where a doctor who resembles him (same eye and eyebrow color) appears with gunk on his face. He cleans himself off, and his face is shown... and then he meets another doctor. The second guy just finished putting a nameplate on his door that says "Patrick Goodrich" so it's undoubtedly Doc and, of course, we don't get to see what he looks like after all. Episode #68 of Marble Hornets contains this, due to the style of film it is. One of the many Tumblr blogs for My Little Pony: Friendship Is Magic, Junebug Answers , had everyone asking what Junebug's cutie mark is, since it didn't appear in the show, being obscured by her saddlebags. She decides to reveal it, only to have Spike jump in front of the camera and block our view of her flank. Done again in To Boldly Flee, where both Lupa and The Nostalgia Chick see what is behind the mask, but the audience doesn't. Lupa is mildly surprised, the Chick is so frightened it shatters her brainwashing. According to Word of God, his face is a mirror of your soul, so the more horrible your soul, the more horrifying whatever lurks behind the mask is. A more humorous example occurs in the previous anniversary special, Suburban Knights. Jew Wario wonders what Todd's face looks like and tries to pull up his mask, only for Todd to pull out a gun and cause Jew Wario to instantly back away. Anytime The Annoying Orange sets up to reveal whether Marshmallow's a boy or a girl. Intern Vithya of Night Vale Community Radio discovered the true identity of The Man In The Tan Jacket and is about to reveal it to the town, but she ascends to Heaven before she can. The Lay Of Pau L Twister has an in-universe example. At the climax, Paul knows why Ken'tu Kel's plan failed despite the oracle's prophecy, but he refuses to tell him so as to not give him the satisfaction of knowing. The reader finds out the secret in the epilogue, though. Ami Yamato, an animated virtual blogger, teases a video where she will reveal what she really looks like... only for it to be her without makeup (a less-flattering face texture with patchier skin, and no eyeliner or lipstick). The Final Episode of WWE Slam City has The Finisher about to reveal his true identity, but he is attacked by a wild raccoon before he can. In the fourth episode of Don't Hug Me I'm Scared, Colin asks the characters where they live, what they like to eat, and what their names are. Duck Guy answers "I live in my house" and Red Guy almost reveals his name, but he's interrupted. A man goes on vacation to France and someone drops a note on his table. He can't read it due to it being in French and asks the waiter to translate it. Upon reading it, the waiter angrily asks him to leave the restaurant. Every time the man asks someone to translate the note, the person he asks becomes angry with him. Years later, he makes friends with a man who speaks French and after building up enough trust, asks his friend to translate it without becoming mad at him. As he's handing the note to his friend, a gust of wind blows it out of his hand. A leprechaun checks into an inn and asks the innkeeper for a piece of banana. After that, his room is rocked by a powerful explosion. Every night, the leprechaun asks for a smaller piece of banana and the following explosion increases in violence. Finally, the innkeeper asks the leprechaun what he's doing in his room that's causing the explosions. The leprechaun agrees to tell him, but only if he promises not to tell anyone else. And to this day, he never has. A boy is born with a genetic abnormality that will eventually lead to an early death. Every year on his birthday, the boy asks his father for a small, yellow ball. Eventually, the boy's disease becomes too severe and he ends up on his deathbed. Knowing his father is curious about his birthday requests, he tells his father "The reason I always asked for a small, yellow ball was..." then dies. A man is lost and hungry and comes upon a monastery. The monks agree to let him stay there for the night as long as he doesn't go into the tower. That night, he's woken by a horrible sound coming from the tower and asks about it the following morning. The head monk says that what's in the tower is a secret among the monks. A year later, the man returns to the monastery and asks to join them. After a long, difficult series of tasks, he finally is accepted into the order. As part of his acceptance, he's shown what is in the tower. However, the person being told the story can't be told what it is because he's not a monk. A young boy decides to make his own lunch for school and makes a meal of little purple grapes. Whenever someone asks what he has, he tells them "little purple grapes" and gets some severe backlash for it. By the end of the story, he's been beaten up, expelled, disowned, and finally arrested. He relates his story to his cellmate who promises to tell him why the phrase "little purple grapes" has caused him so much misfortune if he sneaks out and steals him some cigarettes. The boy does so but gets hit by a car and killed before he returns. Examples of "Sound Effect Bleep"
The 1950's novelty song by Phil Harris, "The Thing" , has the protaganist struggling to rid himself of a !! !, which is drummed over every time it is mentioned. Her Name Is by George Jones replaces any personal details of the woman in question with music - except for the fact she's married. In the video to Radiohead's Just, a man spontaneously stops mid-walk in a street and lies down on the pavement. An ever-growing crowd of passersby assembles and tries to figure out why is he doing it, via unheard but subtitled dialogue. When the man finally reveals the reason he's lying down, the subtitles no longer appear. The next time we see the scene, the entire crowd lies down on the pavement as well. In a Geico commercial, a question comes up as to whether the Gecko is British or Australian. The scene cuts out as he answers the question. In The Firesign Theatre's parody of radio drama "The Further Adventures of Nick Danger", the hero is about to announce his plan to solve a time-travel crisis, but he only gets as far as "All right, everyone, take off your—" before he's cut off by Franklin Roosevelt, announcing the attack on Pearl Harbor — and the United States' immediate and unconditional surrender to Japan. Tweenies, "Being Really Old": The last lines of dialog are the titular characters (kids not more than 5 years old) asking one of their caretakers at playgroup (he's really old): "How old are you?" "Well, if you must know..." Cut to credits. In Harold Pinter's Celebration, the Waiter concludes his closing soliloquy with "one final interjection"... then Fade to Black. In Jak and Daxter: The Precursor Legacy getting every Power Cell before or after you defeat the Big Bad Duumvirate lets you watch a cutscene where the gang unlocks a giant Precursor vault, but all we see are their awestruck reactions and the game cuts to the credits before we see what's behind it. The Kalm flashback in Final Fantasy VII ends this way. It's set up as The Reveal, especially after what happened at Shinra tower, but the story ends on a cliffhanger right before Cloud attacks Sephiroth. This actually upsets Barret and Aeris with them demanding an actual ending, only for Cloud to say that he doesn't remember what happened afterward. Iron Helix: While it's eventually revealed that the crew of the Jeremiah Obrian were accidentally infected with the Iron Helix weapon which is why the ship would no longer accept their commands, it's never revealed what caused the ship to reroute itself to Calliope in the first place. Events in the real world conspired to produce a sort of unintentional Unreveal in the premiere episode of CSI: NY, as The Summation was unexpectedly cut off by the announcement of Yassir Arafat's death. Of course, this has been known to happen in fictional TV shows: an episode of the original Teenage Mutant Ninja Turtles opens with the gang watching a mystery series when their friend April O'Neil breaks in over The Summation to bring in a special report. Similarly, in an episode of the 1990 The Flash (at least in the Eastern time zone), two characters were in a Gun Struggle, the gun went off between them, both characters froze for a beat — and then Dan Rather cut in with a special report about then-President Bush being hospitalized for an ultimately inconsequential heart problem. The report lasted nearly half an hour and pre-empted almost the whole remaining episode. Examples of "you know the rest"
Penn And Teller Foolus, a television series in which they guess how various magic tricks were performed, often invoked this. In theory, if a contestant didn't fool them the secret to their trick was revealed to all. In practice, several times Penn deliberately gave a vague comment that proved they knew the secret, without actually giving anything away. Any time Teller's diagrams were used to reveal the trick, they were shown to the magicians, and then disposed of in various novel ways before either the studio or TV audience saw them. A Real Life example occurred when Alistair Cooke had to record an episode of "Letter from America" dealing with the impending resignation of Richard Nixon from the Presidency. The show was scheduled for broadcast after Nixon made his announcement but had to be recorded beforehand, so the only thing Cooke could do was to give a summary of the mounting Watergate scandal and then, with tongue planted firmly in cheek, declare: "... and the rest — you know." In Pogo, the result of the election of 1952 is announced by a character who can't quite make out the name, but is fairly sure that it contains the letters E, E, N, O, S — the intersection of "Stevenson" and "Eisenhower". On the morning of the 1996 US presidential election, The New York Times crossword puzzle contained this clue: "Title for 39-Across tomorrow." The answer was MISTER PRESIDENT. The remarkable feature of the puzzle is that 39-Across could be answered either CLINTON or BOB DOLE (the two major candidates), and all the Down clues and answers that crossed it would work either way (e.g., "Black Halloween animal" could be either BAT or CAT depending on which answer you filled in at 39-Across). The complete crossword is available here .